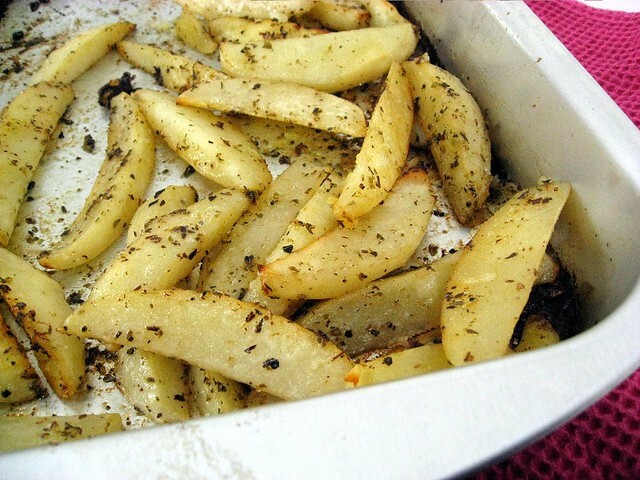 Patates Fournou/Patates Psites/Greek Lemon-Oregano Roasted Potatoes: Whatever you call them, they’re pretty much the best thing ever. – Elly Says Opa! Patates Fournou/Patates Psites/Greek Lemon-Oregano Roasted Potatoes: Whatever you call them, they’re pretty much the best thing ever. First, I wanted to let you know that I have joined the Twitter revolution. Okay, well, I had already joined with a private account but because I can apparently never, ever get enough social media in my life, I’ve created a page that’s more food-related (though I can’t promise it always will be; as you know, I’m prone to tangents). Click here to follow ellysaysopa on Twitter. They’re a staple in Greek households, and for good reason. The potatoes get just a little crispy around the edges (even more if you aren’t rushing to take them out of the oven because you miscalculated and the rest of your meal is ready…not that *I* would ever do that) and are fluffy and pillowy inside. They have a delicious flavor from the lemon and oregano. I also add chicken broth to mine, both for flavor and for the afformentioned fluffy texture. If you don’t have any, though, you certainly don’t need to use it. I alluded to how to make these (alongside chicken) in a post long ago but at that point the only person who read my blog was….well, nobody. Even my husband didn’t read my blog at that point. These potatoes are commonly thrown into roast lamb dishes, too, and often just cooked separately to accompany…well, pretty much anything. I used to make these with a lot more oil than I do now, but I’ve lightened them up over the years, and they’re still one of my favorite sides. 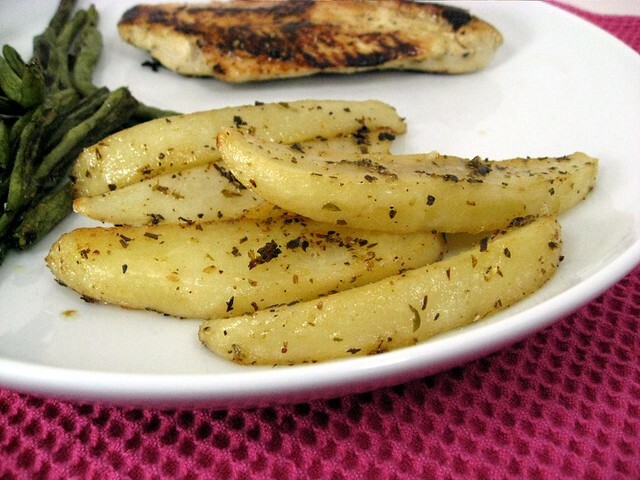 In a baking dish, toss the potatoes, coating well with the oregano, salt and pepper, olive oil and lemon juice. Pour the chicken broth around the potatoes (enough so there is about 1/4-1/3″ of liquid in the pan). Bake for about 50 minutes or until fork tender and crispy around the edges. Check the potatoes 1-2 times as they are baking, and turn them. If they’ve completely absorbed the broth or look like they are sticking, add a little more broth at this time.